The Large Underground Xenon experiment installed 4,850 ft underground inside a 70,000 gallon water tank shield. 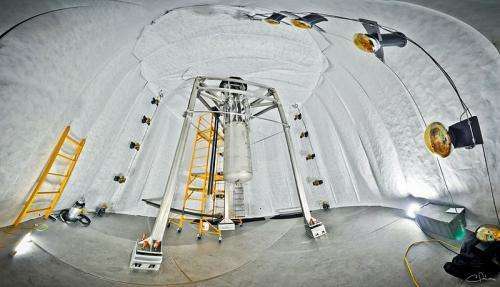 The experiment is a 370 kg liquid xenon time projection chamber that aims to detect the faint interactions between WIMP dark matter and ordinary matter. In its first three months of operation, the Large Underground Xenon (LUX) experiment has proven itself to be the most sensitive dark matter detector in the world, scientists with the experiment announced today. "LUX is blazing the path to illuminating the nature of dark matter," Rick Gaitskell, professor of physics at Brown University and co-spokesperson for LUX. The detector's location, more than a mile underground at the Sanford Underground Research Facility in South Dakota, offers a "supremely quiet" environment to detect the rare, weak interactions between dark matter particles and ordinary matter, Gaitskell said. The first results from the experiment's initial 90-day run were announced today during a seminar at the Sanford Lab in Lead, S.D. "What we've done in these first three months of operation is look at how well the detector is performing, and we're extremely pleased with what we're seeing," said Gaitskell, one of the founders of the LUX experiment. "This first run demonstrates a sensitivity that is better than any previous experiment looking to detect dark matter particles directly." With LUX's initial run complete, the team will now make a few adjustments to fine-tune the device's sensitivity in anticipation of a new 300-day run to begin in 2014. Dark matter is thought to account for as much as 85 percent of the matter in the universe. But because it rarely interacts with other forms of matter, it has yet to be detected directly. The leading candidates for dark matter particles are called weakly interacting massive particles—WIMPS. Theory and experimental results suggest that WIMPs could take either a high-mass or low-mass form. In the search for high-mass WIMPs weighing 40 times the mass of a proton, LUX has twice the sensitivity of any other dark matter direct-detection experiment, according to these new results. LUX also has greatly enhanced sensitivity to low-mass WIMPs, and new results suggest that potential detections of low-mass WIMPS by other dark matter experiments were likely the result of background radiation, not dark matter. "There have been a number of dark matter experiments over the last few years that have strongly supported the idea that they're seeing events in the lowest energy bins of their detectors that could be consistent with the discovery of dark matter," Gaitskell said. "With the LUX, we have worked very hard to calibrate the performance of the detector in these lowest energy bins, and we're not seeing any evidence of dark matter particles there." In the upcoming 300-day run, the LUX researchers hope either to detect dark matter definitively or to rule out a vast swath of parameter space where it might be found. "Every day that we run a detector like this we are probing new models of dark matter," Gaitskell said. "That is extremely important because we don't yet understand the universe well enough to know which of the models is actually the correct one. LUX is helping to pin that down." Though dark matter has not yet been detected directly, scientists are fairly certain that it exists. Without its gravitational influence, galaxies and galaxy clusters would simply fly apart into the vastness of space. But because dark matter does not emit or reflect light, and its interactions with other forms of matter are vanishingly rare, it is exceedingly difficult to spot. "To give some idea of how small the probability of having a dark matter particle interact, imagine firing one dark matter particle into a block of lead," Gaitskell said. "In order to get a 50-50 chance of the particle interacting with the lead, the block would need to stretch for about 200 light years—this is 50 times farther than the nearest star to the Earth aside from the sun. So it's an incredibly rare interaction." Capturing those interactions requires an incredibly sensitive detector. The key part of the LUX is a third of a ton of supercooled xenon in a tank festooned with light sensors, each capable of detecting a single photon at a time. When a particle interacts with the xenon, it creates a tiny flash of light and an ion charge, both of which are picked up by the sensors. To minimize extraneous interactions not due to dark matter, the detector must be shielded from background radiation and cosmic rays. For that reason, the LUX is located 4,850 feet underground, submerged in 71,600 gallons of pure de-ionized water. But even in that fortress of solitude, occasional background interactions still happen. It's the job of LUX physicists to separate the signal from the noise. During its initial run, the LUX picked up xenon flashes in the energy region of interest for dark matter at a rate of about one per day. By looking carefully at the nature of each interaction, the researchers can tell which ones are from residual background radiation and which could be due to dark matter. "Dark matter will interact with the nucleus of xenon atom, while most forms of radioactive background tend to interact with the outer electrons," Gaitskell explained. "Each of those interactions produces a recoil, either of the nucleus or the electrons. So at the rate of about one a day, we see these interactions and test to see if they are consistent with a nuclear recoil or an electron recoil. So far every event we have seen has looked like a conventional electromagnetic background event." But as the detector runs for longer periods, the odds that a dark matter interaction will be captured increase. And the LUX, says Gaitskell, has the sensitivity to catch it. "LUX is a huge step forward. Within the first few minutes of switching it on, we surpassed the sensitivity of the first dark matter detectors I was involved with 25 years ago," he said. "Within a few days, it surpassed the sensitivity of sum total of all previous dark matter direct search experiments I have ever worked on. This first LUX run is more sensitive than any previous search conducted and now sets us up perfectly for the 300-day run to follow." The LUX scientific collaboration includes 17 research universities and national laboratories in the United States, the United Kingdom, Portugal, and Russia. The work is supported by the U.S. Department of Energy and the State of South Dakota. At Brown, 18 postdoctoral researchers, graduate students, and undergraduates have worked on the project. Brown University research associate Simon Fiorucci, postdoctoral researcher Monica Pangilinan, and graduate students Jeremy Chapman, David Malling, and Carlos Faham have been working on the LUX project since its inception. Fiorucci is now the science coordination manager for the project and has been instrumental in delivering the new science. Chapman and Malling's Brown University theses contain the primary analysis used for this latest result. "We are very excited that our thesis work has culminated in this world-leading result," Chapman said. "Support from the administration at Brown was instrumental in the LUX getting the experiment off the ground and enabling us to maintain a leading position in the experiment." Gaitskell said. "The Brown group has been extremely important to making this experiment be the success that it is."